LyondellBasell (NYSE: LYB), the operator of the Clinton Complex has been named to Fortune Magazine's 2019 list of the "World's Most Admired Companies”. This is the second consecutive year that LyondellBasell earned this distinction and was ranked 4th in the chemical industry. Being included on this list is considered prestigious in terms of our corporate reputation. The list identifies the world’s most respected companies, as ranked by peers, boardmembers and financial advisors on the company’s performance in nine key areas - the ability to attract and retain talent, the quality of management, social responsibility, innovation, quality of products and services, use of corporate assets, financial soundness, long-term investment value and global competitiveness. In 2018, LyondellBasell: ▪ improved on its industry-leading safety record ▪ invested in the future by • acquiring A. Schulman Inc., doubling its compounding business, opening new end markets and creating a platform for future growth • breaking ground on the world’s largest Propylene Oxide/Tertiary Butyl Alcohol plant in Texas • advancing its innovative solutions through the construction of the world’s first Hyperzone Polyethylene (PE) plant in Texas ▪ advanced sustainability and the circular economy through a first-ever plastics recycling partnership between a waste management company (Suez) and plastics producer (LyondellBasell); and, ▪ played a leadership role in founding the global, cross-value chain Alliance to End Plastic Waste. "As we begin 2019, we remain committed to providing high quality products and services to our customers, while advancing important initiatives like the newly formed Alliance to End Plastic Waste and the commissioning of the world's first Hyperzone PE plant,” said Bob Patel, CEO of LyondellBasell. LyondellBasell (NYSE: LYB) is one of the largest plastics, chemicals and refining companies in the world. Driven by its employees around the globe, LyondellBasell produces materials and products that are key to advancing solutions to modern challenges like enhancing food safety through lightweight and flexible packaging, protecting the purity of water supplies through stronger and more versatile pipes, improving the safety, comfort and fuel efficiency of many of the cars and trucks on the road, and ensuring the safe and effective functionality in electronics and appliances. LyondellBasell sells products into more than 100 countries and is the world's largest producer of polymer compounds and the largest licensor of polyolefin technologies. 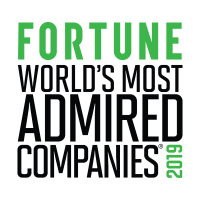 In 2018, LyondellBasell was named to Fortune magazine’s list of the “World’s Most Admired Companies.” More information about LyondellBasell can be found at www.LyondellBasell.com. With approximately 400 employees and contractors, and covering an area of almost 239 acres, the Clinton Complex is one of the largest chemical plants in Iowa. Using natural gas liquids as a feedstock, the plant manufactures ethylene, the world’s most widely-used petrochemical, which is then converted into polyethylene plastic resins. These resins are the building blocks for products such as leak-proof and shatter-proof containers for industrial and household chemicals, packaging that protects food from spoilage and contamination, and children’s toys that are safe and durable.